Carry a stick while walking to signal to potential assaulters that you are prepared for an attack. If you are attacked, don’t let the attackers win. Advice of a safe return is a humoristic and poetic guide for a better life. The performance concists of advice, good and bad, funny and strange, uncomfortable and provocative, and is presented as a mix between slam poetry, stand-up comedy and talk show. The monologue draws your attention towards all this advice, rules and sign posts that almost unnoticable sneaks into your daily life as a devil, as a little voice in your ear constantly telling you what to do and not to do. 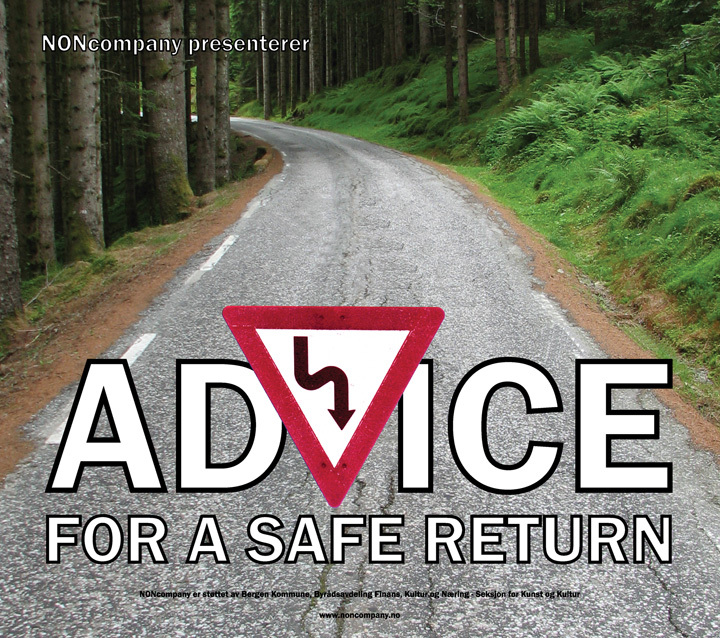 Advice for a safe return is a dynamic monologue written and performed by Lise Risom Olsen. The piece has been performed a number of times, but for each time it is staged in a new version adapted to different rooms, audience groups and settings. This makes it NONcomapny’s most adaptable piece. In the recent versions Advice for a safe return has been a collaboration between Lise Risom Olsen and Havard Pedersen who has played guitar and electronic music to the text. The performance is perfect for festivals or as part of a bigger event. It lasts for approximately 30 minutes and can be performed anywhere with a soundsystem and enough space for a performer and one musician. The first version of Advice for a safe return was produced at the art house, WRAP, in Bergen in 2006. It has been performed in various versions and venues since, such as Landmark, Bergen Kunsthall, theatre and performing arts festivals, in bars and on a school tour in the district of Hordaland, through DKS.